It is hard to beat this location. It really is as close to Times Square as they say. We went to a show at the Hayes Theater, and it was only 1 block away on the same street. The rooftop patio would have been a very cool place to hang out if we had more time there. Excellent staff! Extremely affable and pleasant, made everyone feel at home and welcome. Great space for the price. Staff went out of their way to offer help with room and restaurant options. Room space is big and it was equipped with full kitchen and laundry. Friendly staff, great location, quiet for times Square. The staff was wonderful! Friendly, attentive and helpful. They went above and beyond to make our trip special. Awesome internet Connectivity and speed. Just made this my top choice for NY trips. Room was quiet and very comfortable. We had just gone through an airport ordeal with flight cancellations, freezing outside 2 hrs waiting for taxis that never came, when we finally arrived at the hotel at 2 AM we were greeted with smiles, warmth and patience. The 2 bedroom apartment was beautiful and everything needed was there. The penthouse breakfast area /common lounge is a wonderful place to relax and have a coffee or hot chocolate! Thank you to the staff on night shift! Bonus was location! Perfect location and the one bedroom apartment was very spacious. Exceptionally clean and literally a 2 minutes walk away from Times Square. 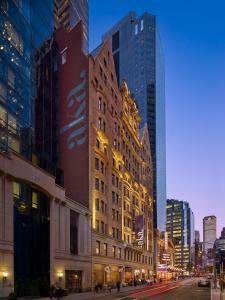 Lock in a great price for AKA Times Square – rated 8.7 by recent guests! AKA Times Square This rating is a reflection of how the property compares to the industry standard when it comes to price, facilities and services available. It's based on a self-evaluation by the property. Use this rating to help choose your stay! 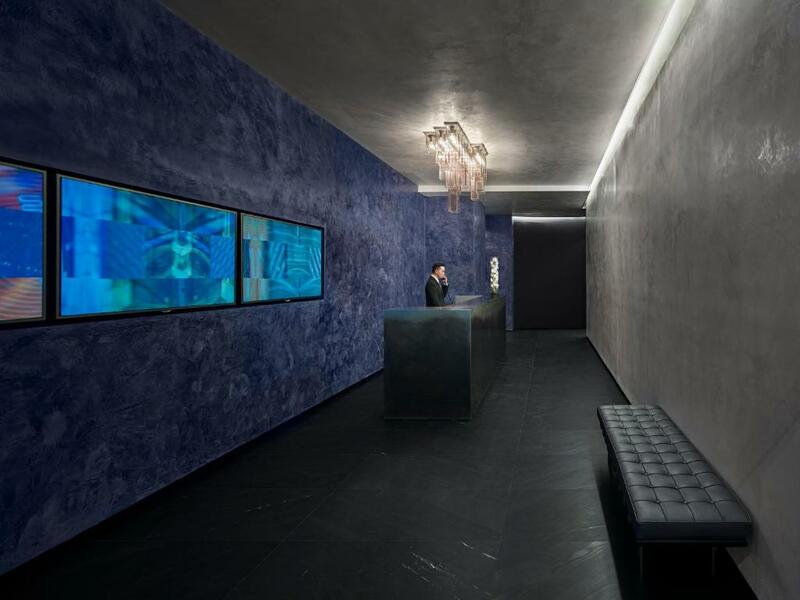 One of our top picks in New York.This New York City property is located 1,600 feet from Times Square. 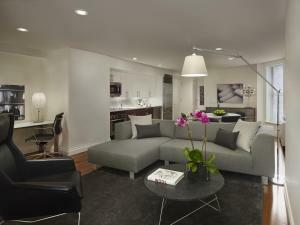 The property features units with fully-equipped kitchens and separate living rooms with flat-screen TVs. The AKA Times Square units include spacious rooms with hardwood floors. The units are equipped with a washer and dryer. The bathrooms offer a glass shower enclosures and bath amenities. The hotel offers a massage service and childcare. The AKA is 1,050 feet from Bryant Park, which features outdoor theater in the summer and ice skating in the winter months. Radio City Music Hall and Rockefeller Center are 2,100 feet from AKA Times Square. 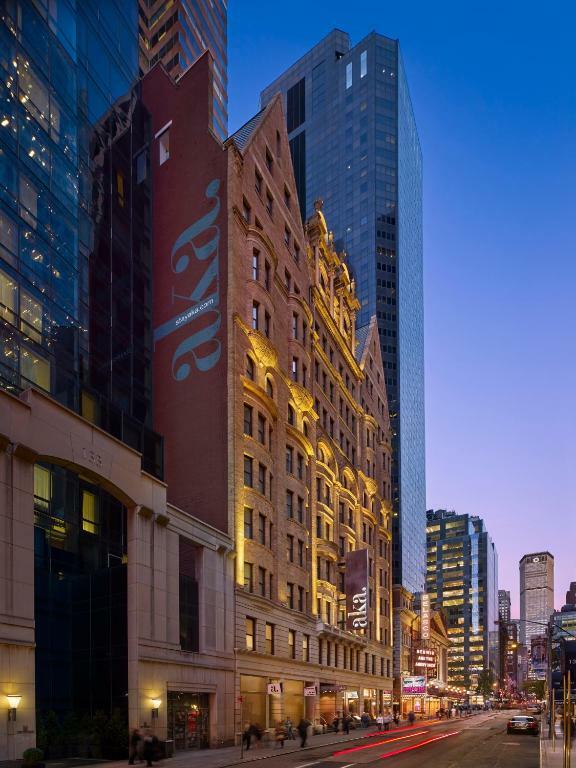 When would you like to stay at AKA Times Square? This suite has cable TV and a private bathroom with free toiletries. This apartment features a full kitchen, flat-screen cable TV and a private bathroom with free toiletries. 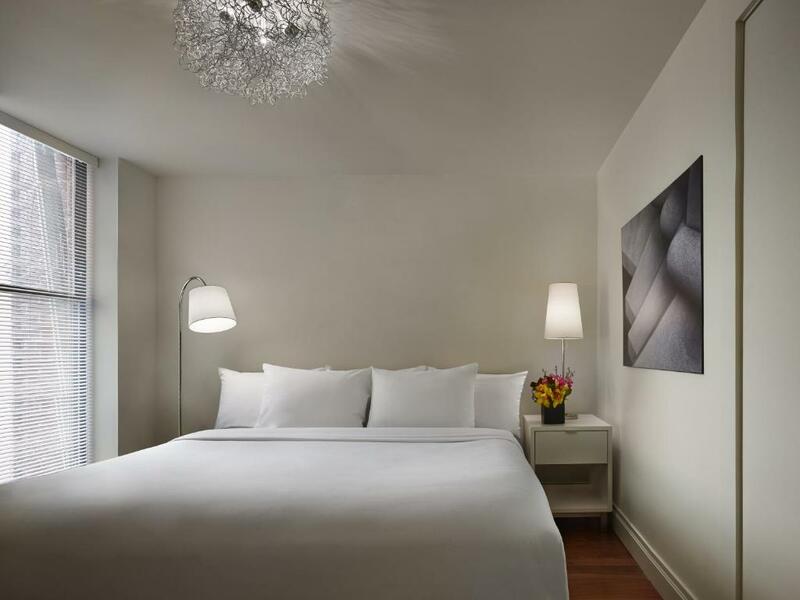 These renovated guestrooms feature design details including sleek contemporary furnishings, custom upholstery, Italian Carrara marble bathrooms, and beds with AKA’s exclusive a.sleep bedding. Enjoy elevated accommodations with access to our chic a.lounge, located on the Penthouse Level. These custom-designed one bedroom Penthouse suites feature a sitting room with hardwood flooring, cutting edge flat-screen TV, and a wet bar. Spa baths are clad in Italian Carrara marble and include both a glass walled shower and separate soaking tub. Bathrooms are furnished with an assortment Bulgari amenities and most include windows. The bedroom features a king size bed dressed in AKA’s exclusive a.sleep bedding and a chaise lounge. This one-bedroom apartment features a den that ranges in size from 755-791 square feet. The apartment features a fully equipped kitchen with sleek stainless steel Sub Zero Bosch appliances, Kohler fixtures, and quartz zodiac island countertops with a frosted glass back splash. Additional features include newly-renovated, spa-like bathrooms with glass shower enclosures and Bulgari amenities; built in closets; washer and dryer; and hardwood floors throughout. House Rules AKA Times Square takes special requests – add in the next step! Any additional children or adults are charged USD 55 per night for extra beds. AKA Times Square accepts these cards and reserves the right to temporarily hold an amount prior to arrival. Please note, guests staying more than 28 nights will receive a rental agreement, which must be signed and returned directly to the property prior to arrival. Please note, this property does not accept cash. AKA was in a great location. Would have liked if they allowed smoking on the outside upstairs terrace..
Room was a little more cramped than we expected. Given the layout of the room, it was hard to find a place to put our suitcases. At the time we booked, the rates were roughly similar for the executive suite w/ a queen bed and the penthouse hotel room with king. We went with the king hotel room, but if we were in the same situation again, I would probably want to pick the executive suite instead. Also, there was some renovation going in the lobby while we were there that kept one of the elevators busy at peak checkout time. Provide the basic items in the kitchen such as teabags, coffee,sugar, milk, salt and extra toilet paper. A non stick frypan would have been handy. Under the impression that it could sleep up to 6 people yet sleeping arrangement for only 4 and charged extra for provision of extra bedding. Information could be provided about closest supermarket for groceries. Beds were a little uncomfortable, even though there was a pull out bed for our daughter they keep only supplying things for 2 not 3 people. Taps in the shower needed time to work out and they needed a hoods elevator as they stopped the lifts one morning and we had to use the stairs. Rooms were great. Location is fab and staff were friendly and helpful. The location is perfect for moving around NYC by subway. The Lounge allows customers to relax before check in and after check out. Though situated in the heart of Midtown, the apartment is amazingly quiet. After many trips to NYC staying at the same hotel, I changed this year to AKA at the last minute. 15 days cramped up in a small hotel room isn’t a pleasant thought. Best move made in a long time! We got a big room at AKA with a combined kitchen plus dining and lounge area. Windows facing the street, a beautiful bathroom with washer and dryer (we didn’t use), and a small spare room where we stored our suitcases and purchases. The bed was big and comfy, Time Square just around the corner, and a great lively Irish/Scottish pub across the road. Helpful and friendly staff, a lift which worked and came quickly, and I couldn’t fault the place. We loved it, and would recommend it to anyone not minding spending a little extra on increased comfort. I booked studio room. They didnt provide reserved room. I asked studio room in the front. They denied because of no more studio room. In this process, very unkind and compulsive. They provided one bed room, not the reserved room. I can not understand, why they receive reservations of studio room. Very spacious, full kitchen, laundry in apartment, comfortable beds.